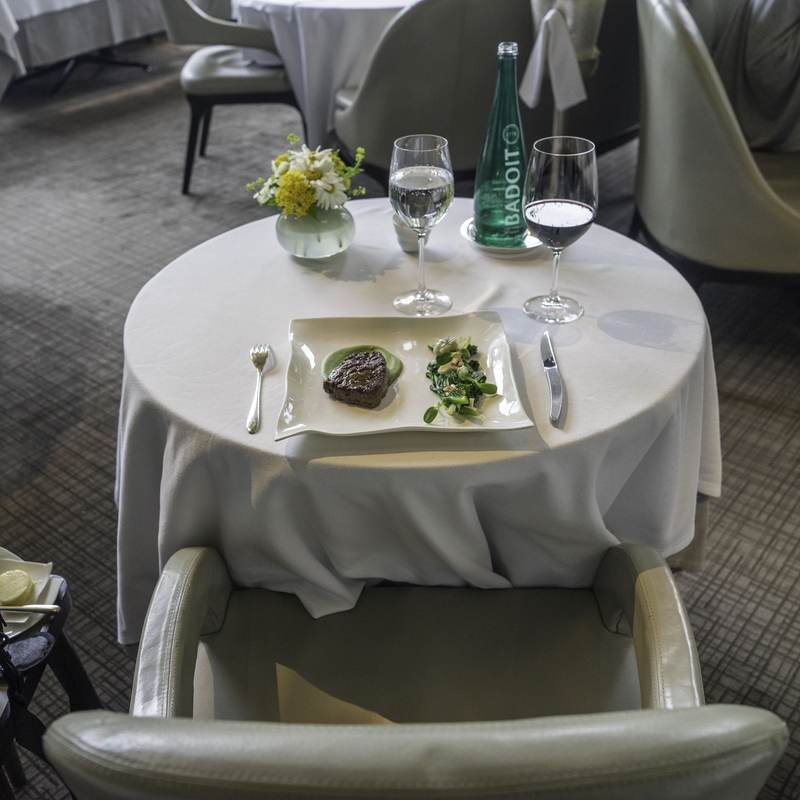 Jean Georges is one of the finest restaurants in New York and is located opposite Central Park. Its a lovely location for a fine dining establishment. Here is a little video of the view from the dining room. The background tune I have used is Young & Beautiful from Lana Del Rey – I don’t own the rights to the song. 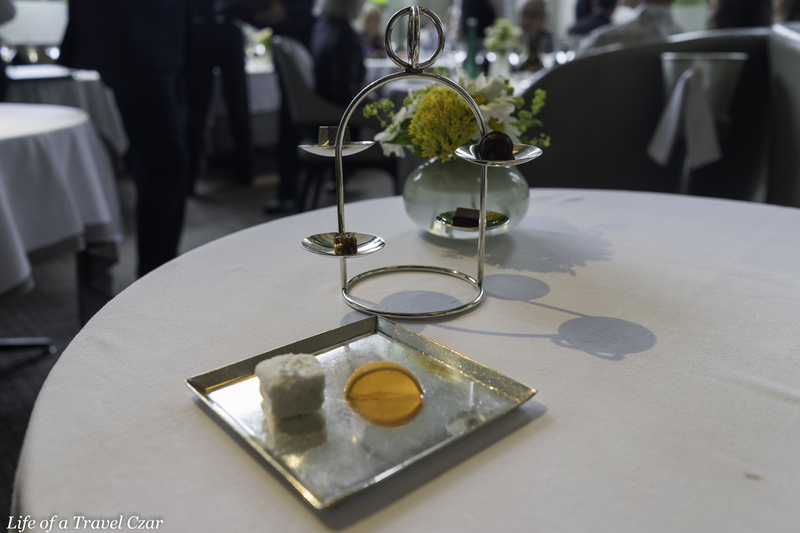 I opt for the Lunch Tasting menu today and with the assistance of the Maître D’ I select some lovely wines from the menu to match the courses on what is a leisurely Saturday afternoon. This champagne is from a small boutique grower. It is named after one of the ships built by Christopher Columbus for his voyages. 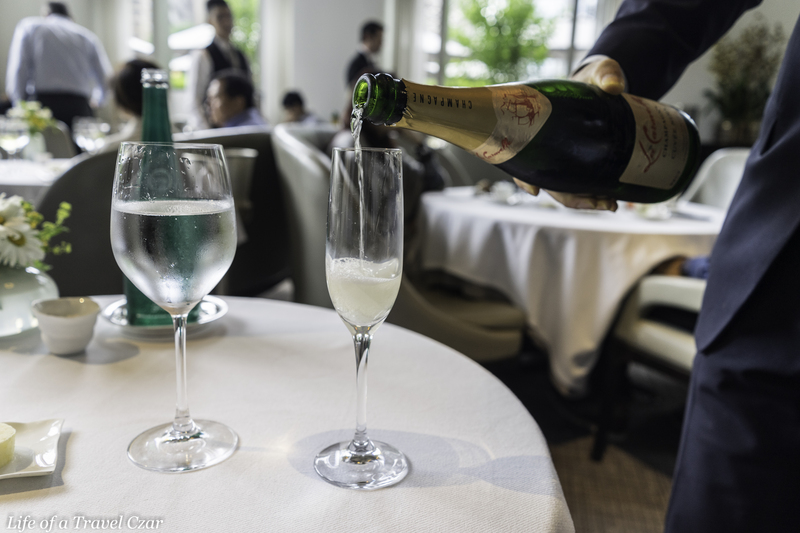 The owners of the winery used to own an acclaimed restaurant in New York of the same name, the restaurant closed but thankfully they continued with the champagne. 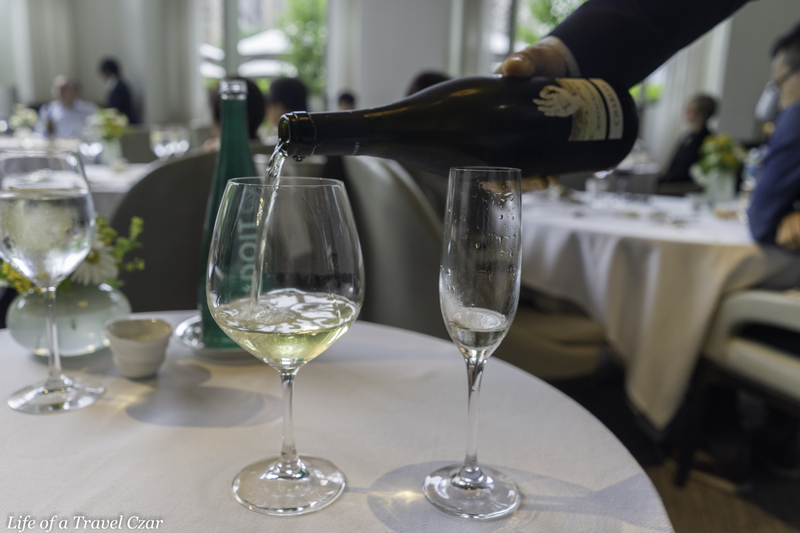 The wine is a blend of 40% chardonnay, 30% pinot noir and 30% pinot meunier. Its has refreshing floral aromas which hits the nose, while on the palate refreshing flavours of citrus and stone fruits dominate with little hints of ginger, honey, and bready notes in the finish. The dish is a fusion of decadence. 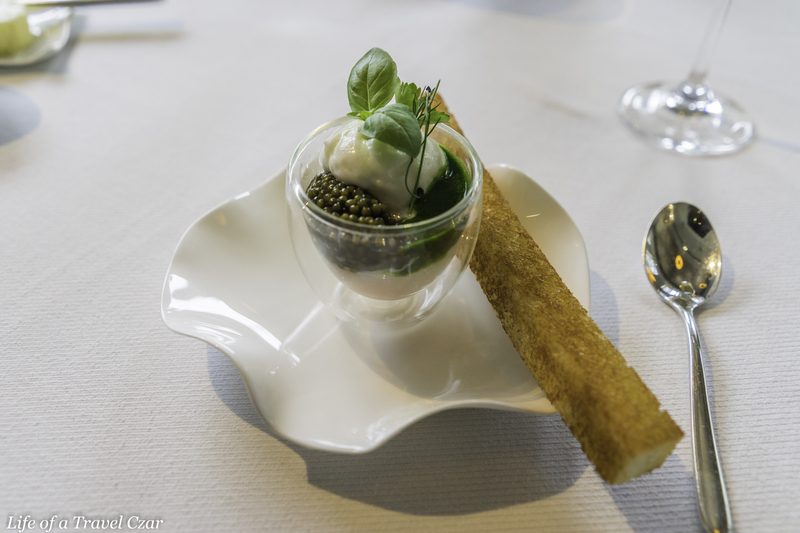 The soft cream, the caviar, the herb puree and the egg. The strength of the caviar flavour leaves a defining imprint, while the cream acts as a rich balancing weight to the caviar and the gooey runny egg yolk and soft gelatine white swirl together for a sensuous taste experience. When spread onto the beautiful crunchy toasted brioche it is an experience in itself. The pairing of this dish with the champagne is flawless. The brioche and champagne are harmonious by design. The seemingly impenetrable fortress of richness which is the caviar cream and egg is deftly pierced by the acidity and citrus flow of the champagne. The sashimi is succulent and has a lovely jelly like texture and it does pair with tart acidity of the vinaigrette. The pastel radishes and microbasil make for a lovely textural contrast to the sashimi. 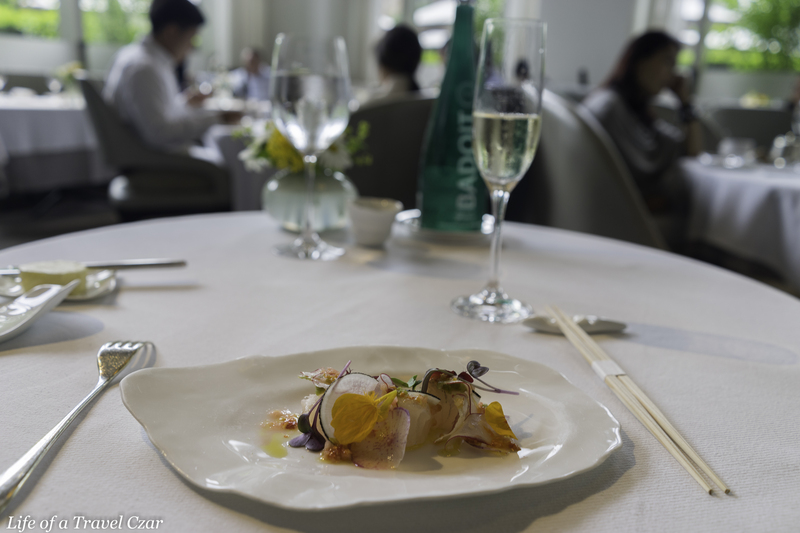 There is a beautiful triangulation of sweet sashimi, the bite of the acidity in the vinaigrette and the champagne. It turns out to be a nice pairing. The Chablis has wonderful citrus aromas which prove to be deft and delicate. On the palate its a little fusion of apple and citrus flavours with some stone fruit hints mixed with a saline and flinty finish. Balancing the fruit is some beautiful pure minerality which makes for an enjoyable drinking experience. 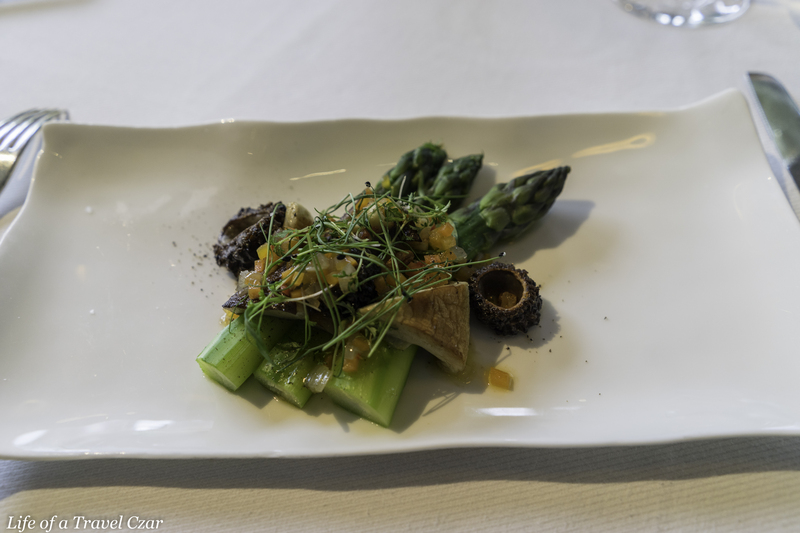 The dish is blanched green asparagus with Morrell and shiitake mushroom vinaigrette. The lovely earthy mushroom are firm, flavoursome and have a wonderful texture on the tongue. The asparagus are nicely cooked and retains a good texture. There is good tartness in the vinaigrette to balance some mild sweet notes of the asparagus. The vinaigrette also has some nice finely chopped vegetables for colour and texture. 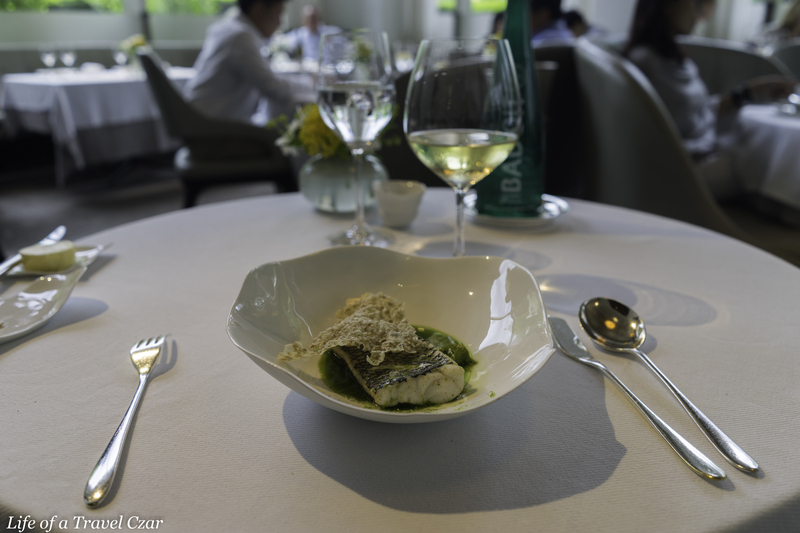 I initially lamented to the Maître D’ initially that asparagus is difficult to pair with and he agrees, however he does note that the Chablis I was intending to pair with the fish (next course) would be subtle enough to “dance” with the asparagus. It turns out (thankfully) to be the case. The sea bass has a beautiful soft and succulent centre done to touch and not overcooked. 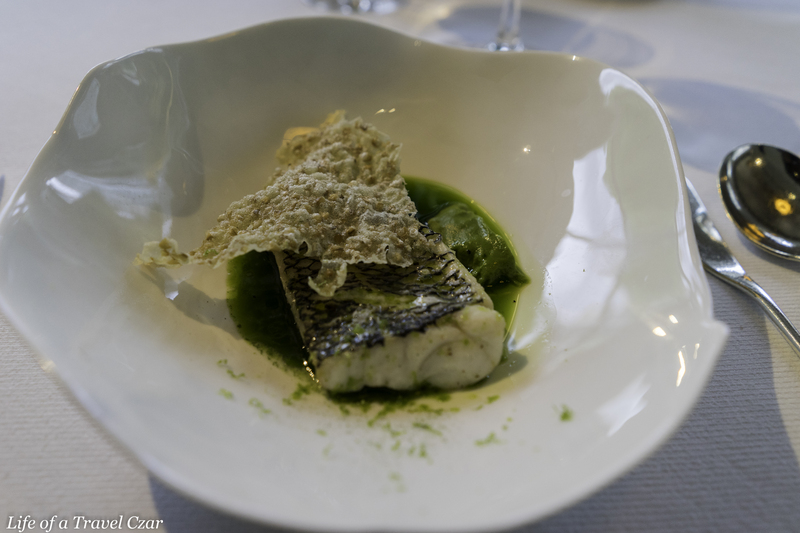 The skin is full of flavour, not crispy and has a good dose of soft rich jelly-like collagen underneath which melds with the sea bass meat to signal a well executed dish. The tart herb lime dressing balances the sweet and salt of the sea bass. The crunchy oat cracker on top adds a textural contrast, but I do ask myself whether its actually needed. The background tune I have used is I Lived from OneRepublic – I don’t own the rights to the song. This is a little gem of wine. It’s the third wine of Château Margaux. Its a blend of 60% Cabernet Sauvignon, 39% Merlot and 1% Cabernet Franc. It is a dense wine with beautiful aromas of spice, mint, baked cherries and black fruits. It is wonderfully flowy on the palate with good fruit (baked cherries and black fruit) with hints of herbs, cocoa and ash. There is not much by way of minerality and some nice silky tannins support the fruit. Its well balanced and unfortunately I think needs a couple of extra years in the cellar but it will do the job for the sirloin. The beautiful succulent juicy steak is what one would expect from this sort of restaurant. Nice charring and smokiness on the outside and tender and full of juices in the middle to make for a wonderful taste experience. The broccoli and japelono purée below has smoothness but has a hit of “heat” in the finish due to the japeleno. The side salad is not particularly interesting with flowering broccolini and charred spring onion and pickled mushroom which are mainly there to cleanse the palate and add some texture I presume. 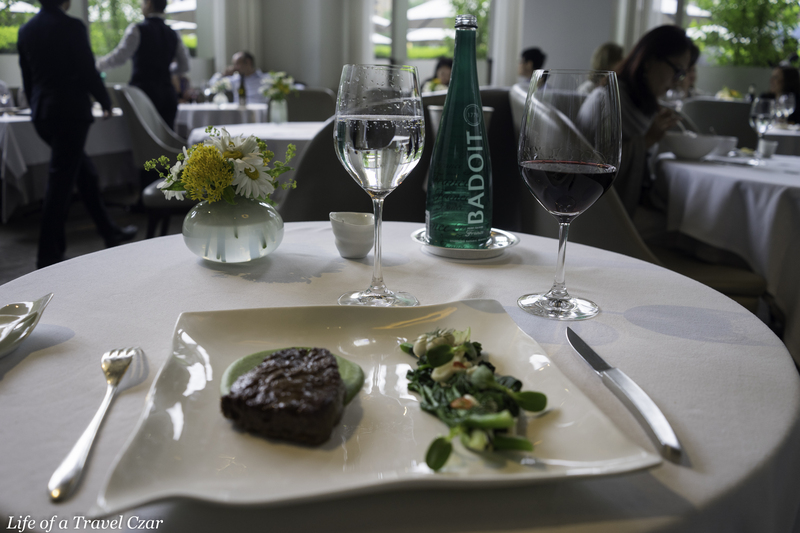 The Margaux proves a wonderful pairing with good tannins and the depth of the wine being perfect for the sirloin. 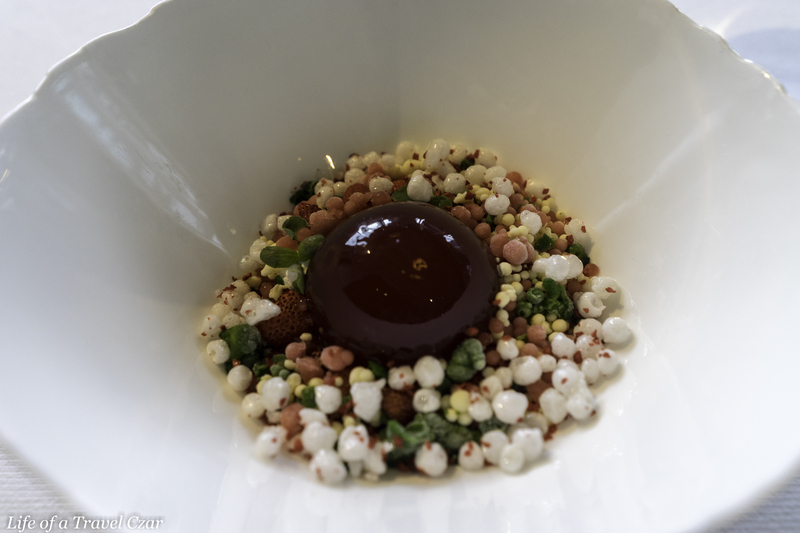 The dish has crunchy tapioca, the Spanish strawberries, basil ice cream, a rhubarb puree base which form the base. Then there is the main attraction; a strawberry and elderflower syrup jelly in the middle. 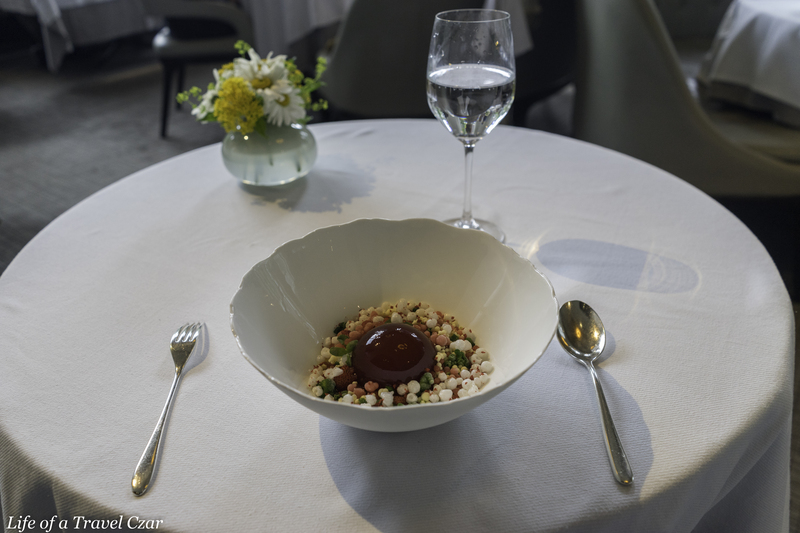 This is a sensory dish indeed; its a mix of textures (crunch, ice, jelly and puree), temperatures and flavours (herb, fruit, super sweetness, tartness and subtle floral). 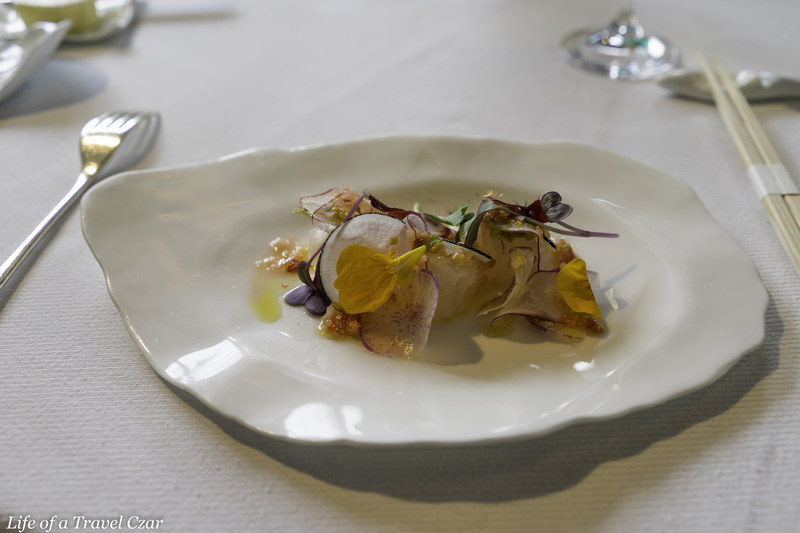 There is the herbiness of the basil, the sweet streak of the rhubarb puree, the mild tapioca which form the base. Then the strawberry jelly has a beautiful taste of strawberries with a mild floral injection from the elderflower. Its worth noting the strawberries are Spanish strawberries. The thing that held the dish was that the strawberries weren’t super sweet as is often the case. There is mild tartness in the Spanish strawberries which added some good balance to sweetness in the dish. 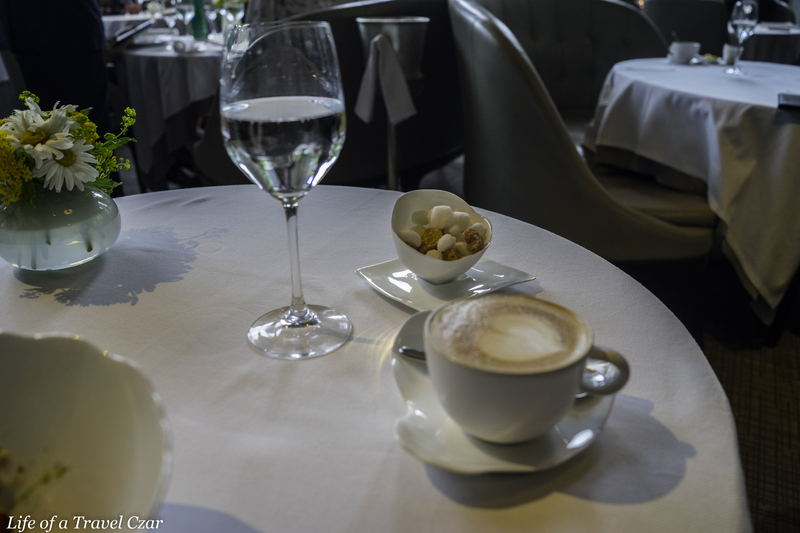 I finish with some coffees and petit fours as the afternoon draws to a close. Thus ends a very enjoyable afternoon. The setting was wonderful with beautiful views of Central Park’s trees from the main dining room, the logistics were flawless with guests being escorted in and out of the venue in harmonious fashion and the service was flawless. 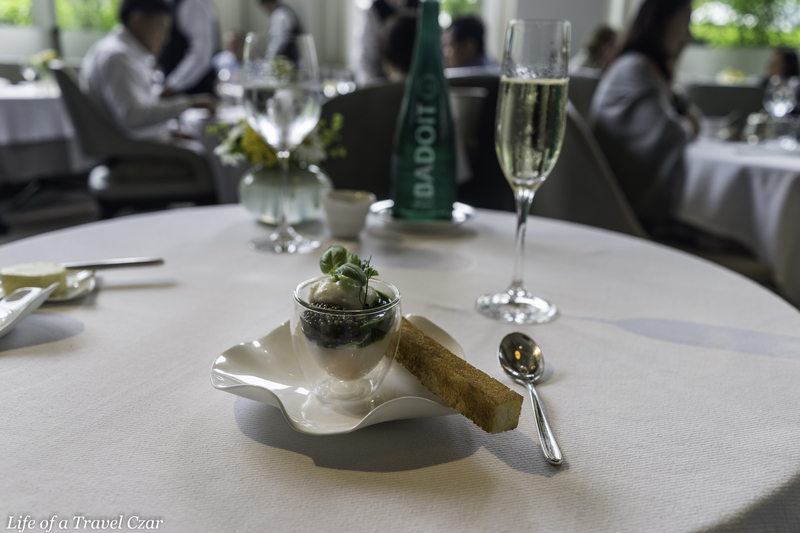 The dishes were generally solid with some notable standouts (the Caviar) and I did find the wines by the glass to be “to taste” with some premium drops available. All in all an enjoyable dining experience. I must confess when I first came along this blog and read a few articles I formed an unfavorable opinion of yourself. Perhaps it was all the first class travel, the well appointed hotels and the highend meals you were consuming. But upon further reading and being able to travel myself it brought me to an understanding that life is all about family, friends and experiences.You my friend are doing just that. The memories that you have made from all these trips will last a life time. I wish you all the best for the future and if I see you in the qantas first lounge in Sydney I might just even shout you a glass of champagne. Thanks for your note. Appreciate you taking the time to comment and glad to hear you’ve come to enjoy the blog and had some amazing travel experiences yourself. Thanks for your best wishes and I do hope to see you in the Qantas First Lounge in Sydney sometime soon. I hope you continue to enjoy all of the wonderful experiences on this great journey we call life.